We are beyond thrilled to finally showcase Above & Beyond’s newly updated and redesigned website. Above & Beyond is almost eight years old, and in our minds due for a modern upgrade, and so we have recreated our website and logo. We would love to hear your feedback on our new look. Above & Beyond is not only committed to designing and decorating original and creative events, but also challenges its clients to think of other services outside of the box. In an effort to showcase all that we have to offer, we will be bringing you some of our favourite events, decor pieces, tips and tricks from the event decor industry, and trends. 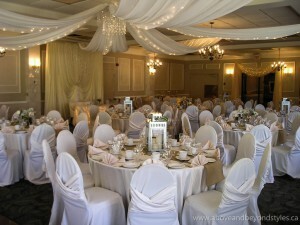 We will also be showing you the in-depth details of some of our fabulous weddings and other events. At Above and Beyond we also offer decor for special occasions, corporate events, window dressings and event co-ordinating. As we prepare to begin our spring wedding season, we hope you can join us at our #BeyondBeautiful Bridal Show on Saturday, March 28th 2015 from 12-4 pm at the Festival Inn in Stratford. Pre-register for FREE admission for you and all your guests. This is the first year for the Beyond Beautiful Bridal Show, co-ordinated by Above & Beyond, and generously hosted by the Festival Inn. We are excited about this brand new challenge and hope to bring you a show unlike any other you have attended! ☐ Set up your wedding email account – nobody wants to spam their personal account, so have this email ready to go to use at these events. ☐ PRE-REGISTER for the show! We cannot exaggerate the importance of this. It will save you time and money. (Our show is FREE when you pre-register here). ☐ Make a quick list of the wedding services you still need so you know which vendors you need to speak to at the show. This will save you time, which you can spend speaking with the vendors you actually need! ☐ Bring a pen and write down your favourite vendors on the back of their business cards. When you return home with an overwhelming pile of stuff, you can remember which ones you liked. ☐ Bring a bag. Not all wedding shows will provide a bag for you, so if you bring a reusable grocery bag you can ensure your hands are clutter free. (Don’t worry you will get one at our show)! ☐ Like the event on Facebook prior to the show. You can see what vendors are going to be there and any other important information. 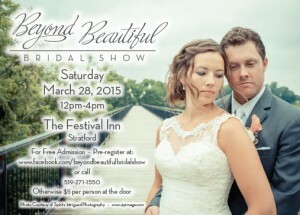 Our show’s Facebook page is: www.facebook.com/beyondbeautifulbridalshow. ☐ Make address labels with the name of the bride and groom, phone number, email address and your wedding date. Use these pre-printed labels to fill out vendor contests quick and easy.